Product prices and availability are accurate as of 2019-04-20 15:41:56 EDT and are subject to change. Any price and availability information displayed on http://www.amazon.com/ at the time of purchase will apply to the purchase of this product. 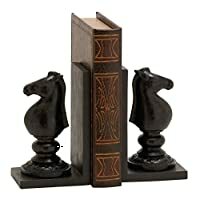 Plow & Hearth Exclusive - Our Chess Board Folding Table mixes work and play. 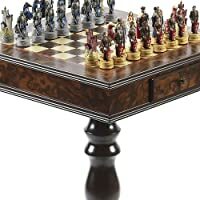 This environmentally-friendly table is carefully crafted of reclaimed wood and metal, and has a grained wooden surface featuring a built-in chess or checkers board for strategy enthusiasts. It makes a unique accent for a screened porch, patio, or even as an indoor table. 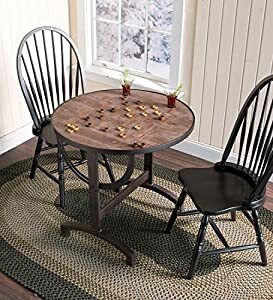 Use this folding table with chess board to play a quick game of chess or checkers with your favorite set, or to hold drinks and plates out on the porch. Fold it down and store it away when not in use or leave it up to charm your everyday guests. 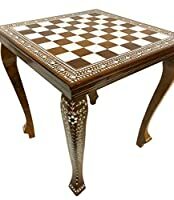 Chess or checker pieces not included.